What is Late Blight of Tomatoes and Potatoes? Late blight is a fungus-like disease that mainly affects tomatoes and potatoes. While there are many diseases that can affect your tomato and potato plants that won't severely impact your harvest, late blight should be taken seriously. Once late blight takes hold, the pathogen, Phytophthora infestans, spreads rapidly and great distances. Late blight, which was responsible for the Irish potato famine, is capable of ruining whole fields of crops. As its name implies, late blight generally occurs later in summer, however, it is also possible to see it earlier in the season. Cool, wet weather encourages the development of the fungus. There are several symptoms of late blight that you should be aware of. Symptoms tend to start off on the leaves of the tomato or potato plant and can include greasy looking, irregularly shaped gray spots on the leaves. A ring of white mold may develop around the spots, especially in wet weather. The leaf spots eventually become dry and papery. Blackened areas may also appear on the stems. Symptoms may move on to affect the fruits. Tomato fruits can develop the same large, irregularly shaped, greasy gray spots. Potatoes can take on a reddish brown discoloration and will become susceptible to soft rot. 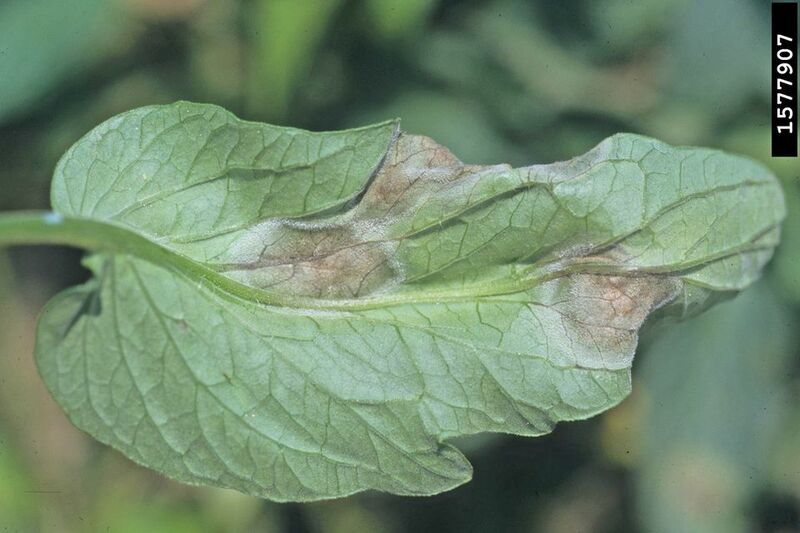 The Late Blight pathogen can only survive if it has a living host to feed on and sustain it. The problem can persist even after the growing season because the pathogen can overwinter in plant debris in or near the garden. In frost-free areas, it will easily overwinter in any potatoes remaining in the ground as well as any potato plant debris left in the garden. A very common way that late blight pathogen survives is in potatoes saved for use as seed. Stored seed potatoes infected with late blight can serve as hosts to the pathogen, even in colder areas that experience frost and freezes. For this reason, if your garden is infected with late blight, it is extremely important that you remove and dispose of all debris at the end of the season. This includes all foliage and all fallen or unused fruits. Do not compost plants or fruits with late blight, since it will just serve to incubate the pathogen, and don't save seed potatoes. What Can You Do About late Blight? Unfortunately, there are three major hurdles with controlling late blight. Once it’s detected, it’s usually too late to save the plant and quite possibly any nearby plants. Late blight develops quickly, so by the time you see symptoms, it has probably been around for awhile. Chances are good that if one plant is infected, all your plants will begin showing symptoms shortly. The spores are air born and can travel hundreds of miles on the breeze. An infected plant in a neighboring town can mean the ruin of crops for that whole region. For this reason, it is very important that you report any suspected sightings of late blight disease to local agriculture authorities. Since late blight will overwinter in plant debris and seed it can continue to spread the following season if gardeners and growers were unaware their plants had been infected. That is why it is so important that you dispose of all plant debris and unused tomatoes and potatoes by the end of the season and that it not be composted and allowed to sit in the area throughout the winter. Because late blight can even overwinter in healthy-looking potatoes from infected plants, if you saved some to plant for next year or even if you simply missed one in the ground and it sprouts next year, you could be in for another season of trouble. If you suspect you have Late Blight, contact your Cooperative Extension Service to get a definite diagnosis. They will appreciate knowing that late blight is in the area and will be able to contact farmers and get the word out to other gardeners to be on the alert. And if late blight is detected in your area, here are some ways to prevent late blight from finding its way into your garden. Your options are limited, but they include planting resistant varieties and a couple of organic fungicides that seem to offer some resistance. Late blight is a serious disease to contend with and should not be taken lightly. It is very important to act quickly and inform the authorities in your area.